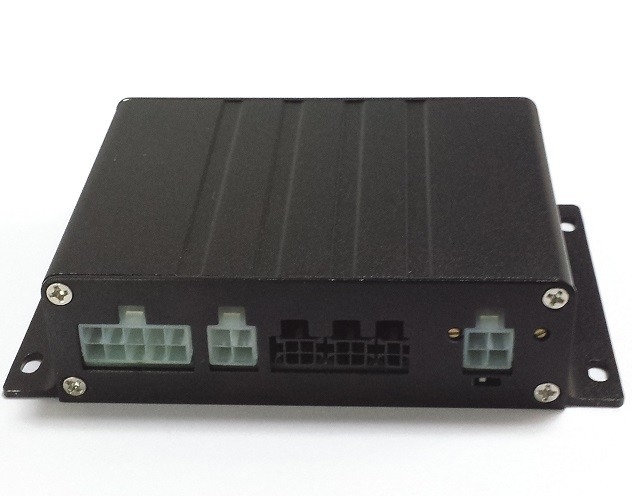 For the Electronic throttle ( EFI ) vehicles , no need add mechanical actuator, the limiter will simulate the voltage value of the vehicle throttle sensor, when the vehicle is over speed, The limiter will give ECU a idle voltage value, ECU will control the throttle according to this voltage value. When the vehicle is in normal driving state(not over speed), the speed limiter will not interfere the vehicle speed. The throttle sensor will give ECU normal driving voltage, let the vehicle keeping normal driving. Then , we can dot a little red glue onto the adjustable knobs to fix it, in order to prevent the adjustable knobs may appear small rotation in the long vehicle driving. ①　Then , we connect the yellow, brown, green ,white wires to the original signal wire of the vehicle. At first, we cut off the low voltage accelerator pedal signal wire. Connect the wire end which is close to the accelerator pedal to the yellow wire of the speed limiter . Connect the rest wire end to the brown wire of the speed limiter. Now it is turn to the other high voltage accelerator pedal signal wire, we also cut it off, Connect the wire end which is close to the accelerator pedal to the green wire of the speed limiter. Connect the rest wire end to the white wire of the speed limiter. ②　We place the speed limiter into the steering room. ③　Find the ACC wire of the vehicle ( it is in the key head, power on when open the key , power off without the key. ) We connect the ACC wire ( green line with black strips ) of the limiter host to the vehicle ACC wire. ④　Find the signal wire of Left-turn indicator and right-turn indicator. Connect the blue wire of the limiter to the signal wire of Left-turn indicator. Connect the orange wire of the limiter to the signal wire of right-turn indicator. 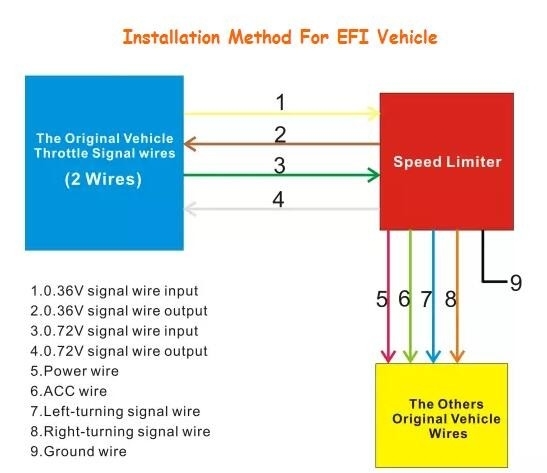 ⑤　If the vehicle has it own speed sensor , we find the signal wire of this original vehicle speed sensor ( normally it is behind the the mile-meter), and connect the gray wire of the limiter to this vehicle original speed signal wire. If the vehicle dose not have its own speed sensor, we add a speed sensor for it, and connect the gray wire of the limiter to the speed signal wire of this speed sensor. Please note that most of the vehicles have the original speed sensor, only a few old vehicles do not have it. ⑥　Connect the red wire with fuse of the speed limiter to the vehicle long power supply in the steering room. ⑦　Connect the black wire with fuse of the speed limiter to any steel part of the vehicle( Ground Treatment). ⑧　Now all the wires have been connected well , Please check all the circuits and fix well. ⑨　Recover all parts , close the dash board , Done! ①　Place the limiter host. The limiter host can be installed in steering room ,a place will not not affect the driver operating. Please pay attention to fix it well, make the lines routing as hidden as possible. 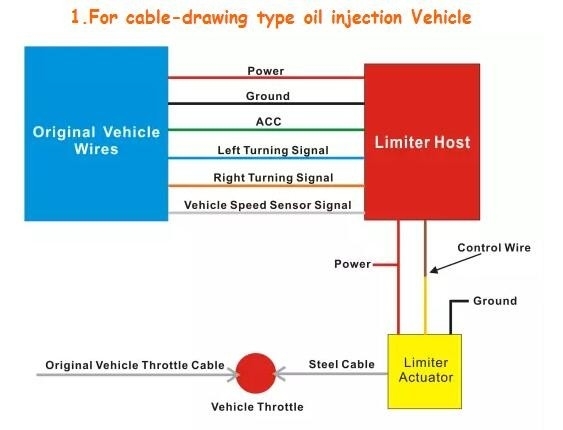 ②　Install the limiter actuator and connect its drawing cable to vehicle throttle cable. At first, we connect the actuator power line well, turn on the power, the actuator will spit its steel cable automatically , turn off the power until the cable completely spit out. Then please step the accelerator pedal to the end state. Make the pull head of the actuator cable pass through the engine throttle control lever. Then cut off the excess portion, fixed the cable head well, make the drawing direction of the limiter steel cable and vehicle throttle cable negative, then fix the limiter well, there is a mounting bracket on the limiter body. Please install it in a appropriate position onto the vehicle with screws. 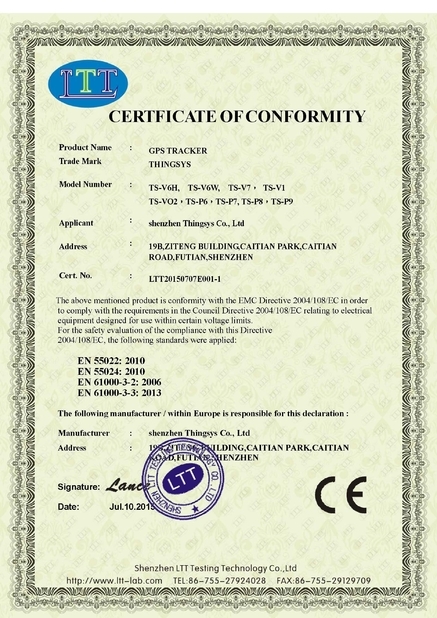 Mechanical actuator is used to control the throttle valve opening, when the vehicle speed in the normal range, the mechanical actuator will be in standby state, will not interfere the driver’s throttle operating. When the vehicle is in over speed state, the actuator will begin working, it will make the throttle valve mouth get smaller compulsively. The driver should not vigorously stamping step on the throttle. We shall not be responsible for the damage caused by this deed. Note: You should choose the actuator model according to the working voltage of vehicle battery. So please tell us the vehicle voltage at first. ③　Connect the control wire of the limiter actuator to the limiter host, and connect the power line and ground line for the limiter actuator. ④　Connect the power line,ground line, ACC line, left-turning signal line, right-turning signal line, vehicle speed sensor signal line to the original vehicle lines one by one. ①　Start the vehicle normally, stepped on the accelerator pedal, to check if the refueling is in normal state.If OK ,it means installation well,otherwise failure. 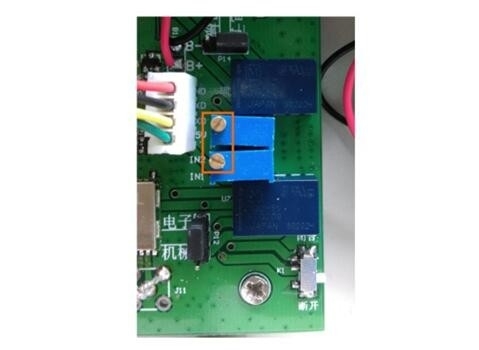 ②　In the refueling process, slide the switch (which is on the PCBA board) to the “close” end, then step on the accelerator pedal, if fueling is failure, it means the installation is successful, otherwise failure. ③　Wait about 3-4 seconds, then slide the switch (which is on the PCBA board) to the “broke” end, then step on the accelerator pedal, if you find refueling is in normal state, it means the installation is successful, otherwise failure. Note: the above test process should not appear the phenomenon of stalling or automatic fueling. If appears, it means some problems exist. if the test situation are the same with the above description, we preliminary estimate the connection and the adjusted idle voltage is right. 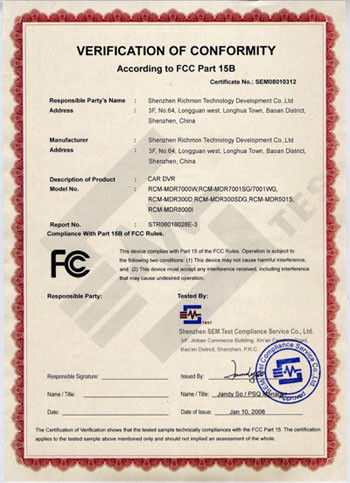 To ensure the 100% right installation, we suggest that the driver take actual road driving test. For tank truck monitoring and management.